SNAICC focuses on the best and most strategic ways to empower our communities and make a difference for our children and families. Your support changes lives. Please contact Interim CEO Emma Sydenham emma.sydenham@snaicc.org.au if you would like to discuss becoming a SNAICC supporter or learning about other current opportunities. Your tax-deductible donations will support education and training opportunities for Indigenous professionals and young people. Your support builds stronger, empowered communities, and better futures for our children and families. Children’s Day is an annual national day celebrating Aboriginal and Torres Strait Islander children, their strengths and cultures. Held on 4 August, it is a day for our communities and the broader Australian community to share and continue cultural traditions, grounding strong and positive identities in our children. Children’s Day is annually launched at a national event hosted by SNAICC and local community events around Australia. As part of Children’s Day, SNAICC produces and distributes resources and activity kits for children, professionals and adults, and helps organisations, schools and communities celebrate in their communities. Join us in celebrating our children, and help support the planning, lead-up and promotion of Children’s Day; host your own event, or join in the many events around Australia! Find out more about becoming a partner for National Aboriginal and Torres Strait Islander Children’s Day. By joining the SNAICC community of members, you help strengthen our sector in advocating for our children and families at all levels of government. SNAICC members are our first point of contact for feedback and input into policy. The SNAICC Executive and Secretariat advocate for and support our members, in both good and in troubled times. Become a SNAICC member to speak up strongly for our children and families. 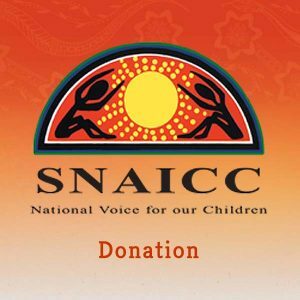 All Aboriginal and Torres Strait Islander community controlled organisations supporting the aims and objectives of SNAICC can become a SNAICC member. The SNAICC biennial conference in September this year has become the largest Aboriginal and Torres Strait Islander family issues conference in the southern hemisphere. Delegates and speakers will gather from around the country and overseas to discuss our challenges and share our knowledge and experiences in raising happy, healthy and confident children in our communities. As well as providing a powerful and inspiring learning experience for all attendees, it will also provide opportunities to meet and experience the rich cultures of our Aboriginal communities. Support this leading professional development event for those working with our children and families through the range of sponsorship and other opportunities. Find out more about sponsorship opportunities with SNAICC’s National Conference. Volunteers and interns form the backbone of our organisation. Thanks to the efforts, passions, and dedication of thousands of volunteers, more than 10,000 working hours were saved last year. You can volunteer in a range of areas including policy and research, training and resource development, campaigns, communications and Aboriginal Children’s Day… just to name a few. We are unable to provide any financial support for volunteers, students or interns at this time, however, some tertiary institutions (for example, the University of Melbourne) provide stipends through internship programs. Potential interns should consult with their relevant faculties at their universities.Course credits for placements should also be arranged by potential students with their relevant faculties at their universities.